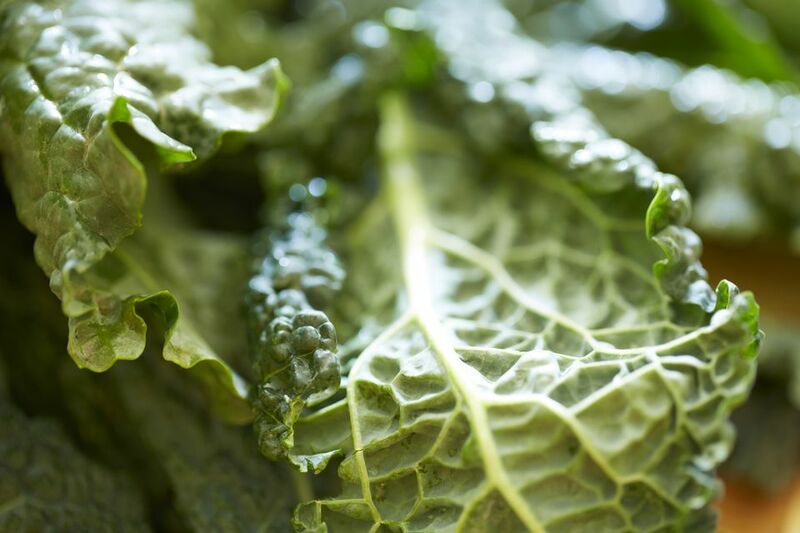 Kale recipes aren't normally on the top of most parents lists when they're looking for vegetables the kids will like. But I urge you to try this crispy kale. It is really extraordinary. Although the kale is roasted, not fried, it becomes crispy and salty, almost like french fries. This kale recipe is incredibly healthy, too. It boasts a whopping 309% of the recommended daily allowance of vitamin A, 201% vitamin C, 14% calcium, 10% iron, 3 grams of protein, 2 grams of fiber, and it only has 112 calories and 1 gram of saturated fat per serving! Place a rack on the lowest shelf of your oven. Preheat oven to 350 degrees F.
Spread kale out on a sturdy baking sheet. Drizzle with olive oil and apple cider vinegar. Toss to coat completely. Bake another 8 to 12 minutes or until kale is crispy. It should be just lightly browned and crispy to the touch. If kale still bends, rather than crackles, when you touch it, it isn't done yet. Return it to the oven. Turn down the heat if it is getting too brown. Continue cooking until crispy. Remove from oven, and sprinkle with sea salt (Maldon sea salt makes it taste fantastic) and serve immediately.